The system shown consists of three optimally coordinated Werner & Pfleiderer components. With the OBER® loading system and efficient VACUSPEED® cooling, you can also build system architectures that are equipped with multi-deck or tunnel ovens. A particular benefit is the automatic loading and unloading of the stationary cell body by means of the OBER®. This means that expensive mechanics in the vacuum unit that are susceptible to failure can be dispensed with. 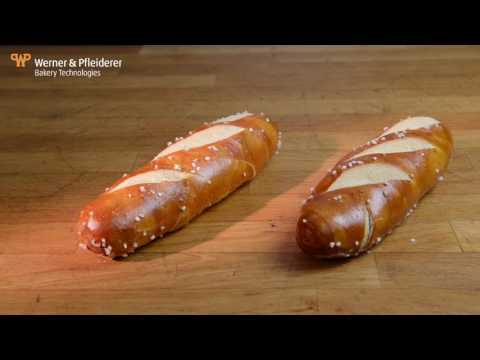 In the VACUSPEED® vacuum cell, products are cooled in no time immediately after baking to extend the freshness and crispness of the products and simultaneously make them immediately ready for cutting and packaging. The combined WP modules DECK / multi-deck / tunnel oven, VACUSPEED® and OBER® for the fully automated baking and cooling process guarantee efficient baking, long-lasting freshness and crispness. All information is non-binding. We reserve the right to make changes to reflect technical advancements. Oven-hot goods are cooled to a low temperature level in the vacuum cell in 6 to 8 minutes on average. Conventional cooling methods require about 45 minutes and two-thirds more energy input. VACUSPEED® cools down goods hot from the oven within minutes to a temperature of +4 °C to 8 °C. The cooling process extends the shelf life of baked goods by up to 3 weeks. Since germs are killed during evacuation process, the finished products are put into the packaging practically free of germs. With its patented, dough-specific technological procedure the VACUSPEED® vacuum cell cools quickly, gently and with minimal loss of moisture. The result is juicy and firm baking goods of the highest quality. We will gladly advise you individually on vacuum conditioning, whether for use in manual, semi-industrial or industrial processes.